I'm a bit late posting the Roman bioarchaeology news for the month of July because of my move and new job, but there's a great deal to report on as a result of summer excavations. Rather than date of announcement, this month the news will be organized based on the historical period the remains are from. Marsiliana, Italy. Centuries' worth of Etruscan remains are being found thanks to excavation by the Association Etruria Nova. The 8th-7th c BC necropolis of Macchiabuia, for instance, includes around 40 tombs. Cremated remains have been found, generally two or more individuals in each tomb. One tomb interestingly has two cremated individuals (possibly male and female adults) and one inhumed individual (a child), suggesting differential burial practices. The link above gets you more information about the project, the finds, and the field school. Alken, Denmark. 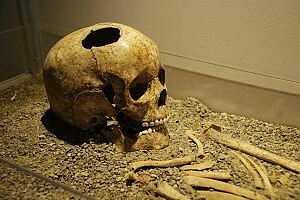 Roughly 200 skeletons have been found in the Jutland peninsula of Denmark dating to around the 1st c BC-1st c AD. Technically, the Romans never reached that far north, but the traumatic injuries to many of the individuals buried in this cemetery suggest violence, possibly related to the political and social upheaval that was happening just to the south with the onslaught of the Roman army. DNA analysis is ongoing and should prove very interesting. Jerusalem, Israel. Have skeletons from the Temple Mount massacre of Jews by Romans been found? One journalist thinks he's found them. But others suggest the skeletons are from a Byzantine grave or other such use. This finding (and the reporting of it) is fairly politically charged. Norfolk, England. The largest and best preserved Roman cemetery in Norfolk has yielded 85 graves so far, dating to the 3rd-4th centuries AD. The most interesting burial is a decapitation, where the head was placed between the feet (see photo at right). There are virtually no grave goods associated with the burials. Coverage can be found at the BBC and Current Archaeology. Debelt, Bulgaria. Two marble tombs dating to the 2nd-3rd centuries AD were found when a truck drove over top of them (unknowingly, of course). Also found were gold medallions and other artifacts. Justinianopolis, Turkey. A Roman sarcophagus was found submerged off the coast of ancient Justinianopolis in Turkey. It seems to depict Eros and Medusa, and it dates to the 2nd-3rd centuries AD. Maryport, England. Fragmentary skeletons are coming out of an excavation at Camp Farm, an early Christian burial ground dating to around 400-600 AD. Coverage of the ongoing excavation comes from the BBC and Popular Archaeology. Salisbury Plain, England. 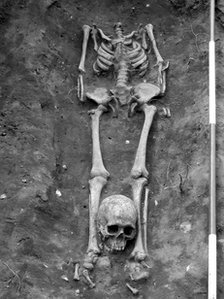 Remains of two skeletons have been uncovered by British soliders as part of their rehabilitation from injury program: a woman in her early 20s and a man with a shield. Archaeologists think there may be 14 or more burials yet to be excavated, all dating to about the 6th century AD. Middlewich, England. Archaeologists are searching for a Roman-era cemetery, after preliminary testing or excavation revealed the presence of cremation urns. Kletthamer Feld, Bavaria. A new study of Y-chromosomal and mtDNA has been published on a population from Upper Bavaria dating to the 4th-5th centuries AD. Based on their findings, the authors think the individuals were members of the military and their families. Nis, Serbia. Several dozen early Christian tombs have been found in Serbia in the Jagodin-mala necropolis. No report yet on the skeletal remains, but the linked article has a picture of a skeleton in a cist grave. Plovdiv, Bulgaria. 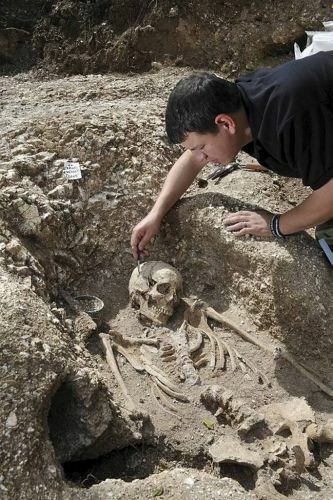 Early Christian burial ground dating to the 4th century AD has been found. It is likely part of the ancient necropolis of Philippopolis. Byblos, Lebanon. Six stone tombs dating to the Late Antique/Byzantine period were found at ancient Byblos. More are expected to be found. Each tomb held multiple burials, possibly family tombs. Florence, Italy. And the Mona Lisa skeleton is back in the news this summer. See my continued skepticism of this find and the hoopla surrounding it. London, England. BONE at the Florence Nightingale Museum. Now through August 31. Lots of, well, bone-related objects on display. If you're in London and bored with the Olympics, go check it out! Manchester, England. Faces and voices: Identity, culture, and artefacts from Roman to contemporary Egypt. Now through November 25. Includes a nice collection of Roman-era mummy portraits, one of my favorite burial treatments. Rome, Italy. Museo del Convento dei Frati Minori Cappuccini. Now open. This new museum of "human archaeology" should prove to be a nice complement to the Capuchin crypt in Rome. Go check it out and report back to me! Rome, Italy. Museo di Storia della Medicina at La Sapienza. Now open. Another new museum in Rome, this one covers the history of medicine. It includes skeletons and artifacts from the large Imperial cemetery of Collatina, as well as the so-called Bambina di Fidene, a 2nd century child who had been trepanned. More information (in Italian, of course) at La Repubblica and Affaritaliani.it. As above, let me know if you check this out. Alain Touwaide of the Smithsonian thinks that Romans' quest for new medicinal herbs may have impelled them to all ends of the Empire. His idea is based on historical records for the most part. And doesn't really make any sense. Maybe an article would convince me, though.